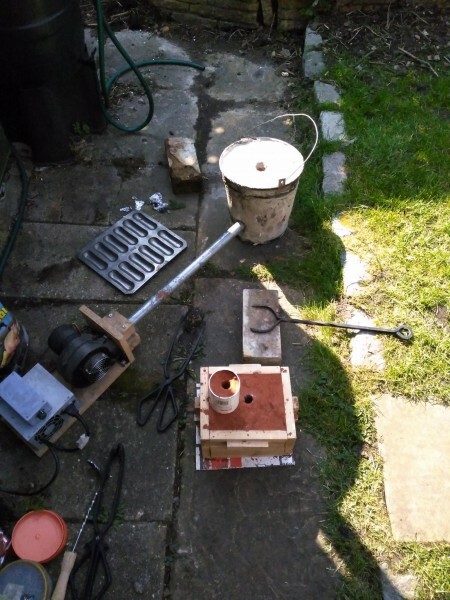 There’s not a lot of preparation to the furnace other than plugging in the fan and connecting the pipe to the side of the flowerpot furnace. However, one key piece of preparation is to ensure is the layout. You want to have a clear path between the furnace and the location of the sand (or ingot mould). 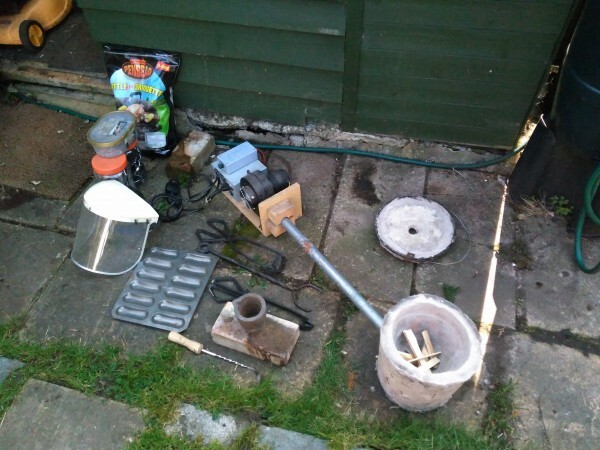 You’ll also need somewhere to put the lid when the furnace is open, and somewhere to put the crucible when swapping from lifting tongs to pouring shank. It’s been a while since my last go so I did a dry run of the process before the furnace was lit. 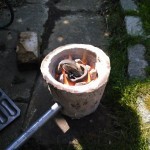 I’ve tried both the hardwood charcoal and briquettes. The briquettes do seem to be easier to work with mostly because of their regular size. I try to avoid the self lighting stuff as it seems to smoke for a lot longer. To get things started a firelighter and kindling is used. I avoid putting the blower at the beginning so the fire can get established. The furnace is brought up to temperature relatively slowly. 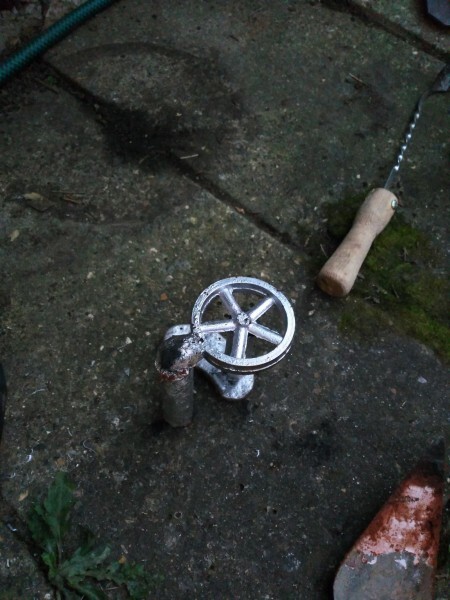 Once the metal starts to melt, more scrap can be added and the dross scooped off the top. Because I’ve been using old hard disk shells there is not too much waste but the platters do generate a lot. 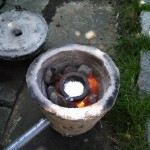 Once you’ve got a full crucible of molten metal you can pour it into the mould. 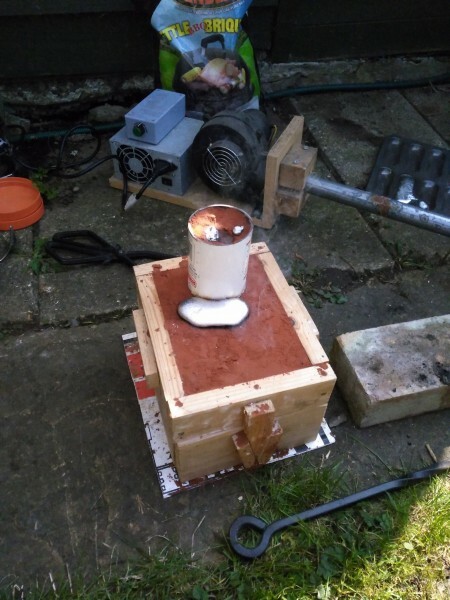 I had my ingot trays ready in-case there was too much, you don’t want to leave metal in the crucible as it might cause cracking when it cools as the crucible and metal cool at different rates. Following the pour, it’s a case of waiting for things to cool. I gave mine a good 20 minutes to solidify. 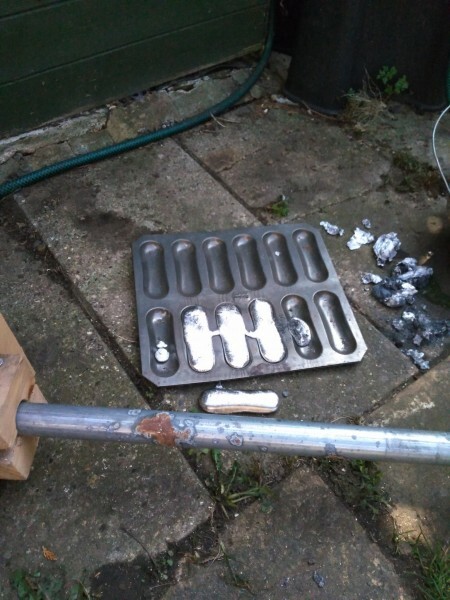 Whilst I was waiting I melted a second batch of metal and poured some ingots. This will help on the next melt as there will be less skimming to do as all the dross is already out of the metal. Also I wanted to know the capacity of the crucible. It’s 3 1/2 ingots, I’ll do some calculations later to determine what volume that is. 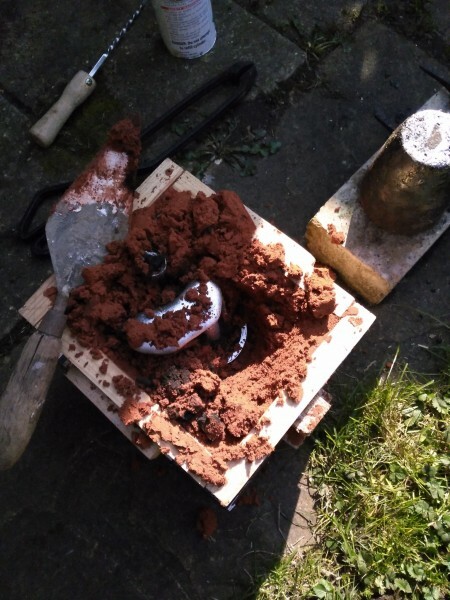 After I’d poured my ingots I opened up the sand to help with the cooling. There was still a lot of heat in the metal and sand at this point. 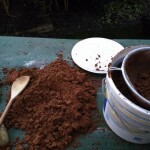 After another 20 minutes I dug the casting out of the sand and spread the sand around for cooling. 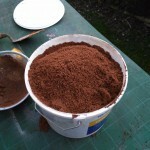 I sieved my sand to removed the carbonised pieces and to spread the darkened sand around. At some point I’ll need to freshen up the sand but the quantity of sand to casting is large at the moment so I’ve a few more castings before that’s an issue. The top edge of the furnace suffered some damage again, I’ll have to patch that up next time. Perhaps fireclay rather than mortar might be better. 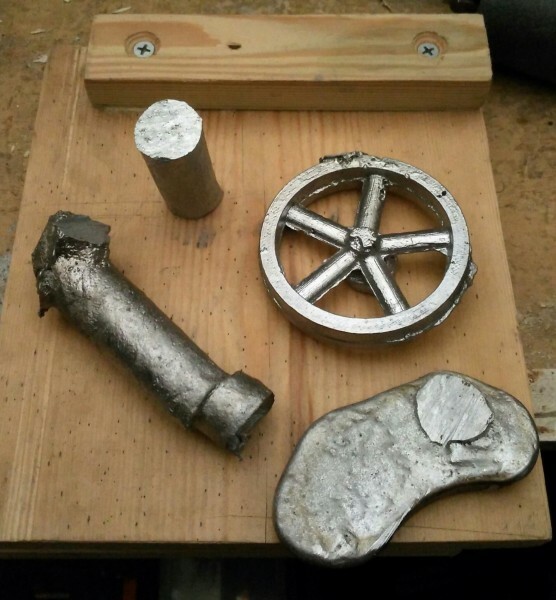 I sawed the riser and runner from the casting, and the blob from the riser. I might be able to use the two cylinders for something but the blob will go back into the next melt. The flywheel has come out pretty well, I’ll see when I machine it if there are any issues. It should just need a light skim to clean up the outer surface and needs boring to accept the spindle. I’ve yet to determine exactly how it will be attached but perhaps a simple keyway will work. 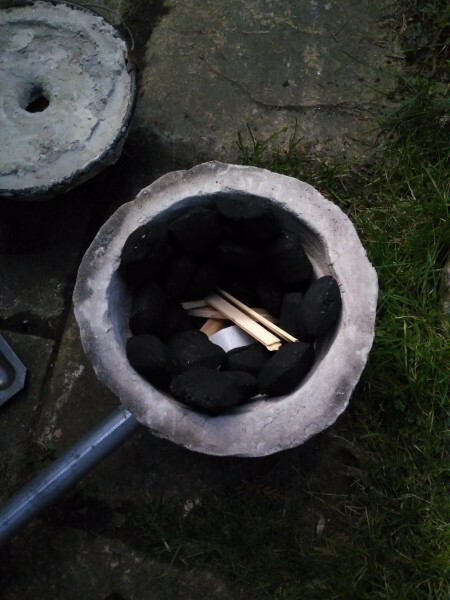 I nearly choked when I saw you were using briquettes, but then you are casting in Aluminium, so that’s okay. I found they are useless above about 800C, not enough carbon, too much clay and muck. The ready to light charcoal is pretty poinless as you say. They burn pretty completely leaving little ash so there can’t be that much binder. There is a mention of anthracite in the ingredients which might help. The hardwood charcoal has lots of little bits in it which is fine if you are making a BBQ but are no use for the furnace. 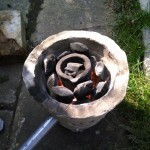 The briquettes are primarily chosen for their shape. I suspect it’s mostly the oxygen in the air that is burning. Lionel from backyard metal casting has successfully melted brass with charcoal but I’ve not tried that yet. I do have a K-type probe but not wired it up yet so don’t know what temperatures I am achieving. Thank you for showing how to cast a flywheel. I especially appreciate your comments on not letting the metal cool in the crucible as it might induce cracking. I will keep all of this in mind for my next aluminum project!